Crimson hadn’t realized she never backtracked—not until Gator said it. But it was true; backtracking irritated her. Elevated her heart rate. It held no appeal for her. She jumped system almost every time they finished a high paying bounty. Never stayed in-system longer than two or three bounties, regardless of pay. Even going back for a good cause, like picking up decent tech, was a hard sell. Gator had been persuasive. But as the week in Jump progress Crimson felt herself slipping further and further into a black mood. She stopped going to the mess. She avoided crew contact. 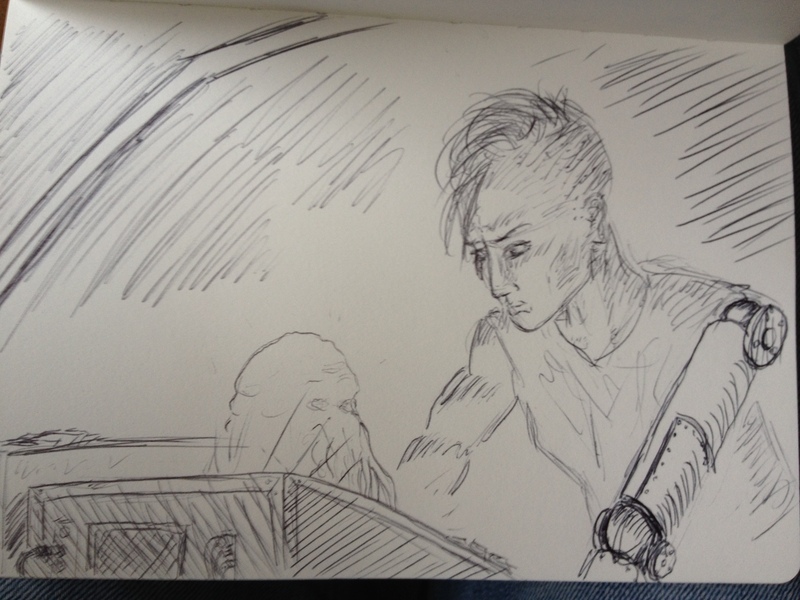 She stayed in her bunk, cursing the abominable space-reptile for badgering her into the journey. Then again, having an encryption decoding device would allow them to find criminal’s by their transmissions. They could have an ear to the wall, and catch their quarries easier. It would make turning in a bounty less time consuming, and more effective. Nothing the scum didn’t deserve. She held that thought in front of her, a small light; it kept her from turning massive seed ship around and setting course for a different system. If Javert had had better equipment, he probably could have caught Jean Valjean, too. She picked at the wall with her human finger. That would make her less miserable. They’d try out the decoding device as soon as possible. Qualvana likely had plenty of criminals…. “Okay, Shaak-Rom, this is what I’m been working on…” Andross tone was at once placating, condescending, and childishly proud of himself. The human male, former 1 Unit Missile Pilot racer from Talconis VII, keyed in the entry code to Shuttle Bay 2 (the oft neglected, secondary dumping ground for miscellaneous, bulk items deemed too big or useless for the cargo hold), and stepped aside with a presenter’s flourish. Shaak-Rom sniffed, refusing to move forward. His long, dread-like head tendrils flipped and lifted forward to taste the air beyond for anything suspicious. He was still getting used the sensory black-out on his right side where the drug lord’s lasers had severed the ends of three of his tendrils. His people called them togatu, and they provided a Trivven with more than just taste or smell—it was a sense: clearer than heat sensors, deeper than touch. His right side was healing acceptably, but was now partially blind. But his left togatu could smell or see nothing usual coming from the shuttle bay. Shaak-Rom ignored the comparison of his own red skin and striped horns to the human’s god of evil. He’d had to look it up after Andross’ many references. It was unfortunate that human’s seemed to associate horns with wickedness; but then again, his world’s devil was the hornless, dreadless, blind god of chaos. If Skibarukan looked a bit like human, it could hardly be helped. Shaak-Rom stepped forward to investigate. The shuttle bay’s motion sensors registered his entry and the lights flicked on. The cavernous shuttle bay opened over him, and a confusing pile of blocks, crates, discarded equipment, covered in a light dusting of empty food cans greeted him. Shaak-Rom nodded slowly. The haphazard piles of rubbish were beginning to form a logical sense. Shaak-Rom nodded slowly. Tactical training with the crew would be advantageous. He was the custodian of the arsenal key ring—not that the crew were untrustworthy with weapons (most were liscensed to carry a personal side arm through the Galactic Precinct)—but anything done with the Rival Bay’s equipment had to go through Crimson, and she was persnickety about its use. Plus, Andross had a way of rubbing her wrong; it was obvious why Andros had come to him instead. The female cyborg wasn’t likely to give Andross permission to do anything. She’d take it far better from Shaak-Rom. The Trivven crossed his arms, and nodded again. “Yes!” Andross pumped a fist in the air. Clidjitt’s voice chimed through the intercom. Crimson sat up slowly from her chair. She had been dozing… at least as much as her clicking Mindframe let her. A stupor, really, with incessant computer diagnostic background chatter. Finally. She’d actually ‘slept’ through disembarking the Magway. “’mon my way,” She mumbled. She lurched up from the chair, and punched the lever releasing the door clamps. She could have taken the burst-feed in her quarters, but the walk would clear her cloudy head. With her signature step-and-clank cadence she dragged her mechanical leg with her through the crew quarters, past the Circle, and up the steps to the catwalk. Half-hauling, half-vaulting up the steps she clobbered down the catwalk to the bridge. The Brev, an insectoid who looked more or less like a giant ant, sat in the pilot’s seat. Filling the forward viewer was the boiling, steamy green atmosphere of Qualvana. Crimson crashed the weight of her metal pelvis into the co-pilot’s seat and let the chair do all the work of hefting her ridiculous leg. He robot arm draped across the control console. “Bring him up,” she grunted to Clidjitt. “Not a Captain,” Crimson grunted. “You’re not?” the Gortassa asked.